When we visited Audemars Piguet’s Private Museum last summer, we were shown “the rarest watch ever made by Audemars Piguet.” The wristwatch in question, according to the brand’s historian, Michael Friedman, a perpetual calendar from 1955. It was the first perpetual calendar wristwatch with leap year indication ever made, and it was Audemars Piguet who had made it. “We made three examples in 1955 and six examples in 1957,” said Mr. Friedman. Twelve months later, the Royal Oak Perpetual Calendar is back, with some sizeable changes. A lot has changed but the perpetual calendar remains one of, if not the most important complication for Audemars Piguet. To measure the importance of the perpetual calendar to the brand, one only has to look at Giulio Papi’s wrist. When we met with the Director of Audemars Piguet Renaud & Papi last year, he took great pleasure in showing us his personal Royal Oak Perpetual Calendar in steel with platinum bezel, a watch he helped create. At the time he joked the watch was getting harder to read with age (his 50th birthday being just around the corner) and was thinking about increasing the size of the indications. I thought nothing of it then, but it turns out he was sharing a rare hint while the brand’s marketing department wasn’t listening. The most obvious change, and the one Mr. Papi supposedly made for himself, is a larger case. In order to increase the legibility of the dial, the size of the watch has been increased to 41mm. Otherwise, the watch preserves the appeal of the original Perpetual Calendar: day, date, moon, month and leap year are beautifully displayed and more legible than they were previously. In fact, the detail of each is easier to appreciate, especially the intricate astronomical moon phase. 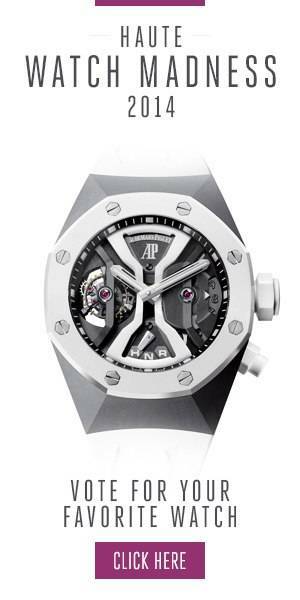 And the added space has also allowed Audemars Piguet to add an outer chapter ring to indicate the 52 weeks of the year. Inside, the watch houses caliber 5134, an automatic movement based on calibre 2120 but modified to fit into the updated 41mm case size. Featuring a stunning 22-carat gold oscillating weight, and highly finished, it can be fully admired through the glare-proof sapphire crystal caseback. While the size of the watch may be a little restrictive, there is reason to believe it will be a hit with ladies as well. After all, Audemars Piguet was the first to introduce a ladies’ wristwatch equipped with a perpetual calendar, and given the interest women have shown in mens’ complication in recent years, one would expect the latest generation of perpetual calendars would fall in line with their expectations. Available in four versions, in steel for $60,900 or in yellow gold for $95,700, with either a white or a blue dial.